Personal protective equipment (PPE) is the equipment or a device which is intended to be worn or otherwise used by an employee at work and which protects the employee against one or more risks arising from the operation to the employee’s safety or health. It includes any addition or accessory to the equipment designed to meet a similar objective. It protects the employee from hazards and any harmful conditions (existing and potential) which may result in injury, illness, or possibly fatal injury. PPE can be an item worn on the body, such as gloves, or a device, such as a protective shield or barrier. Besides face shields, safety glasses, helmets, and safety shoes, personal protective equipment also includes a variety of devices and garments such as goggles, coveralls, gloves, vests, earplugs, and respirators. Examples of some of the personal protective equipments are given in Fig 1. PPE is an important means of preventing work injuries. Ideally, the best approach is to maintain a safe work environment and eliminate any potential hazards. PPE is only to be relied upon as a last line of defense in places where it is not practicable to control the hazards at source. PPE is designed to protect the employee from serious workplace injuries or illnesses resulting from contact with chemical, radiological, physical, electrical, mechanical, or other workplace hazards. It is one of the ways to protect employees. However, it does not eliminate or reduce the hazard. It only places a barrier between the employee and the hazard. If the PPE fails or is not used, then the employee is not protected from the hazard. The use of PPE generally implies working in a potentially hazardous work environment and its use is a major means of injury prevention. Therefore, it is of prime importance to ensure that the equipment chosen is both reliable and effective. Also, it is being properly used and maintained, and the user has undergone adequate training. All PPE equipment and clothing are to be of safe design and construction and are to be maintained in a clean and reliable way. Organization is to take the fit and comfort of PPEs into consideration during their procurement. PPEs are to be appropriate and must meet the requirements of workplace. PPEs which fits well and are comfortable to wear encourage employees to use them. Most PPEs are available in multiple sizes, and care is to be taken to procure PPEs of the proper sizes so as to meet the needs of all the employees. If several different types of PPE are to be worn together, then it is to be made sure they are compatible. If PPEs do not fit properly then they can make the difference between being safely covered or dangerously exposed. In such a case they may not provide the level of protection desired and may discourage employees to use them. Protecting employees from potential head injuries is a key element of the employees’ safety. A head injury can impair an employee for life. It can also be fatal. Wearing a safety helmet is one of the easiest ways to protect an employee’s head from injury. Safety helmet can protect employees from impact and penetration hazards as well as from electrical shock and burn hazards. It provides protection against (i) hitting of the head by falling objects from above (ii) bumping of the head against fixed objects, such as exposed pipes or beams, (iii) to take care of the possibility of accidental head contact with electrical hazards. In general, safety helmets resist penetration by objects and absorb the shock of a blow. They are to be water-resistant and slow burning. Employees are to clearly understand the importance of proper adjustment and replacement of the suspension and headband. Safety helmet must have a hard outer shell and a shock-absorbing lining which incorporates a headband and straps which suspend the shell from 2.5 cm to 3.2 cm) away from the head. This type of design provides shock absorption during an impact and ventilation during normal wear. Head protection which is either too large or too small is inappropriate for use, even if it meets all other requirements. It is important that the safety helmet must fit appropriately on the head of the employee. The safety helmets normally come in a variety of sizes with adjustable headbands to ensure a proper fit (many adjust in 3 mm increments). A proper fit allows sufficient clearance between the shell and the suspension system for ventilation and distribution of an impact. The helmet is not to bind, slip, fall off or irritate the skin. Face shield devices can be attached to the helmet without changing the helmet strength and electrical protection. For this, a metal face shield bracket system can be used on the helmet. Employees, who face possible foot or leg injuries from falling or rolling objects or from crushing or penetrating materials, are to wear protective footwear. Also, employees whose work involves exposure to hot substances or corrosive or poisonous materials are to have protective gear to cover exposed body parts, including legs and feet. If an employee’s feet are exposed to electrical hazards, nonconductive footwear is to be worn. On the other hand, workplace exposure to static electricity may necessitate the use of conductive footwear. Foot and leg protection is necessary (i) when heavy objects can roll onto or fall on the employee’s feet, (ii) working with sharp objects such as nails or spikes which can pierce the soles or uppers of ordinary shoes, (iii) exposure to liquid metal which can splash on feet or legs, (iv) working on or around hot, wet or slippery surfaces, and (v) working when electrical hazards are present. Foot and leg protection choices include (i) leggings with safety snaps for quick removal which protect the lower legs and feet from heat hazards such as liquid metal or welding spark, (ii) metatarsal guards made of aluminum, steel, fiber or plastic to protect the instep area from impact and compression, (iii) toe guards made of steel, aluminum or plastic fit over the toes of regular shoes to protect the toes from impact and compression hazards. Normally the toe box is incorporated into the footwear during construction and is an integral part of the footwear, (iv) combination foot and shin guards to protect the lower legs and feet, and can be used in combination with toe guards when greater protection is needed, and (v) safety shoes which have impact-resistant toes and heat-resistant soles that protect the feet against hot work surfaces. The metal insoles of some safety shoes protect against puncture wounds. Safety shoes can also be designed to be electrically conductive to prevent the buildup of static electricity in areas with the potential for explosive atmospheres or nonconductive to protect employees from workplace electrical hazards. Foot powder is not to be used in conjunction with protective conductive footwear because it provides insulation, reducing the conductive ability of the shoes. Silk, wool and nylon socks can produce static electricity and are not to be worn with conductive footwear. Conductive shoes are to be removed when the task requiring their use is completed. Electrical hazard, safety-toe shoes are nonconductive and prevent the employees’ feet from completing an electrical circuit to the ground. These shoes can protect against open circuits of up to 600 volts in dry conditions and are to be used in conjunction with other insulating equipment and additional precautions to reduce the risk of the employee becoming a path for hazardous electrical energy. Safety shoes for the area where liquid metal is being handled must keep liquid metal from lodging in the shoe eyelets, tongues or other shoe parts in addition to insulating the feet from the extreme heat of the liquid metal. These snug-fitting leather or leather-substitute shoes have leather or rubber soles and rubber heels. All such shoes are to have built-in safety toes. Employees can be exposed to a large number of hazards which can pose danger to their eyes and face. Employees need to have appropriate eye or face protection if they are exposed to eye or face hazards from flying particles, liquid metal, liquid chemicals, acids or caustic liquids, chemical gases or vapours, potentially infectious material, or potentially harmful light radiation. Everyday use of prescription corrective lenses do not provide adequate protection against most occupational eye and face hazards, so it is necessary that employees with corrective lenses either wear eye protection which incorporates the prescription into the design or wear additional eye protection over their prescription lenses. Examples of potential eye or face injuries include (i) dust, dirt, metal or wood chips entering the eye from activities such as chipping, grinding, sawing, hammering, the use of power tools or even strong wind forces, (ii) chemical splashes, mists and vapours from corrosive substances, hot liquids, solvents or other hazardous solutions contacting the eye from activities such as pickling, degreasing and electroplating, (iii) objects swinging into the eye or face, such as chains, tools or ropes, (iv) radiant energy from welding, harmful rays from the use of lasers or other radiant light (as well as heat, glare, sparks, splash and flying particles). Selecting the most suitable eye and face protection for employees is to take into consideration (i) ability to protect against specific workplace hazards, (ii) need to fit properly and be reasonably comfortable to wear, (iii) need to provide unrestricted vision and movement, (iv) need to be durable and cleanable, and (v) need to allow unrestricted functioning of any other required PPE. Some of the most common types of eye and face protection include the following. Safety glasses which have safety frames constructed of metal or plastic and impact-resistant lenses. Side shields are available on some models. Safety glasses are not to be used for protection against chemical splashes, mists or vapours. Goggles are tight-fitting eye protection which completely cover the eyes, eye sockets and the facial area immediately surrounding the eyes and provide protection from impact, dust, mists, vapours and splashes. Goggles with direct ventilation typically are used for impact hazards and dusts, not for protection against chemical splashes or vapours. Goggles with indirect ventilation are used for protection from dusts and splash hazards. Goggles with no ventilation provide protection from dusts, splashes, mists and vapours. Goggles with foam or cloth padding are not to be used for chemical splash protection. Some goggles fit over corrective lenses. Welding shields are constructed of vulcanized fiber or fiberglass and fitted with a filtered lens. They protect eyes from burns caused by infrared or intense radiant light. They also protect both the eyes and face from flying sparks, metal spatter and slag chips produced during welding, brazing, soldering and cutting operations. The filter lens shade number must be appropriate to protect against the specific hazards of the work being performed. Laser safety goggles are specialty goggles to protect against intense concentrations of light produced by lasers. The type of laser safety goggles to be used depends upon the equipment and operating conditions in the workplace. Face shields are protective devices to shield the employees’ face and eyes from various hazards. Face shields are typically used to provide protection from dust, liquid splash and spray hazards. The face shield windows are available in a variety of materials, shapes, thickness, shades and tints, depending on their particular application. Commonly available windows are transparent sheets of plastic or wire screen. Some are polarized for glare protection. The face shield windows are designed to extend from the eyebrows to below the chin and across the entire width of the employee’s head. Face shields when used in conjunction with spectacles or goggles; provide a higher level of protection to the employees face and eyes. In case of welding operations, the intense light associated with welding operations can cause serious and sometimes permanent eye damage if operators do not wear proper eye protection. The intensity of light or radiant energy produced by welding, cutting or brazing operations varies according to a number of factors including the task producing the light, the electrode size and the arc current. In case of laser operations, laser light radiation can be extremely dangerous to the unprotected eye and direct or reflected beams can cause permanent eye damage. Laser retinal burns can be painless, so it is essential that all employees in or around laser operations wear appropriate eye protection. If a workplace is such that the employees face potential injury to hands and arms which cannot be eliminated through engineering and work practice controls then employees are required to wear appropriate protection. Potential hazards include skin absorption of harmful substances, chemical or thermal burns, electrical dangers, bruises, abrasions, cuts, punctures, fractures and amputations. PPE includes gloves, finger guards, and arm coverings or elbow-length gloves. It is extremely necessary that all possible engineering and work practice controls are explored to eliminate hazards and use of PPE is to provide additional protection against hazards which cannot be completely eliminated. There are many types of gloves available these days to protect against a wide variety of hazards. The nature of the hazard and the operation involved affects the selection of gloves. The variety of potential occupational hand injuries makes selecting the right pair of gloves challenging. No glove provides protection against all potential hand hazards. It is essential that employees use gloves specifically designed for the hazards and tasks found in their workplace since gloves designed for one function may not protect against a different function even though they may appear to be an appropriate protective device. The factors which influence the selection of protective gloves for a workplace are (i) type of chemicals handled (toxic properties of the chemicals), (ii) chemical concentration and temperature (the higher the concentration and temperature, the shorter the breakthrough time), (iii) nature of contact (total immersion, continual contact, splash, etc. ), (iv) duration of contact, (v) area requiring protection (hand only, forearm, arm), (vi) degree of dexterity (fine motor work), (vii) grip requirements (dry, wet, oily), (viii) thermal protection, (ix) size and comfort, (x) abrasion/cut resistance requirements, and (xi) other job hazards (such as biological, electrical, and radiation hazards). Gloves are usually made from a wide variety of materials and are designed for many types of workplace hazards. In general, gloves fall into four groups namely (i) gloves made of leather, synthetic fibers or metal meshes, (ii) gloves made of fabric and coated fabric, (iii) gloves for chemical protection, and (iv) gloves made of insulating rubber gloves. Leather, synthetic fiber or metal mesh gloves are sturdy and provide protection against cuts and burns. Leather or canvas gloves also protect against sustained heat. They protect against sparks, moderate heat, blows, chips and rough objects. These gloves can be used for tasks such as welding. Aluminized gloves provide radiant heat protection by reflection and insulate/reduce heat conduction with a liner or insert. Employees working with liquid metals are benefitted with this type of glove. Aramid fiber gloves protect against heat, are cut resistant and abrasion resistant and wear well. Employees working in jobs such as firefighting, metal fabrication, and ceramic handling are benefitted with this type of glove. Synthetic gloves of various materials offer protection against heat and cold and are cut resistant and abrasion resistant. They also withstand some diluted acids. These materials do not stand up against alkalis and solvents. Fabric and coated fabric gloves are made of cotton or other fabric to provide varying degrees of protection. Fabric gloves protect against dirt, slivers, chafing and abrasions. They do not provide sufficient protection for use with rough, sharp or heavy materials. Adding a plastic coating strengthens some fabric gloves. Coated fabric gloves are normally made from cotton flannel with napping on one side. By coating the unnapped side with plastic, fabric gloves are transformed into general purpose hand protection and have slip resistant qualities. These gloves are used for tasks ranging from handling bricks and wire to chemical laboratory containers. Chemical protective gloves are made with different kinds of rubber such as natural, butyl, neoprene, nitrile and fluorocarbon (Viton) or various kinds of plastic such as polyvinyl chloride (PVC), polyvinyl alcohol and polyethylene. These materials can be blended or laminated for better performance. Generally, the thicker the glove material, the greater is the chemical resistance, but thick gloves can impair grip and dexterity and have a negative impact on the safety. Different glove materials resist different chemicals, and glove compatibility can vary from manufacturer to manufacturer. Butyl gloves are made of a synthetic rubber and protect against a wide variety of chemicals, such as peroxide, rocket fuels, highly corrosive acids (nitric acid, sulphuric acid, hydrofluoric acid and red-fuming nitric acid), strong bases, alcohols, aldehydes, ketones, esters and nitro compounds. Butyl gloves also resist oxidation, ozone corrosion and abrasion, and remain flexible at low temperatures. Butyl rubber does not perform well with aliphatic and aromatic hydrocarbons and halogenated solvents. Natural (latex) rubber gloves are comfortable to wear, which makes them a popular general purpose glove. They have exceptional tensile strength, elasticity and temperature resistance. In addition to resisting abrasions caused by grinding and polishing, these gloves protect employees’ hands from water solutions of acids, alkalis, salts and ketones. Latex gloves have caused allergic reactions in some individuals and may not be appropriate for all employees. Neoprene gloves are made of synthetic rubber and offer good pliability and finger dexterity, and are high density and tear resistant. They protect against hydraulic fluids, gasoline, alcohols, organic acids and alkalis. They generally have chemical and wear resistance properties superior to those made of natural rubber. Nitrile gloves are made of a copolymer and provide protection from chlorinated solvents such as trichloroethylene and perchloroethylene. Nitrile gloves stand up to heavy use even after prolonged exposure and offer protection when working with oils, greases, acids, caustics and alcohols but are generally not recommended for use with strong oxidizing agents, aromatic solvents, ketones and acetates. Rubber insulating gloves are meant for protecting against electrical shock. These gloves are available to meet different voltage exposures. Lightweight low voltage gloves are for use on voltages under 1,000 volts. Gloves for use on high voltage are of thicker material for the dielectric strength. As the use voltage rating increases so does the glove weight. Rubber gloves are to be visually inspected and an ‘air’ test is to be performed before they are used. Electrical protective equipment is to be subjected to periodic electrical tests. Test voltages and the maximum intervals between tests are to be as per the appropriate standards. Protective gloves are to be inspected before each use to ensure that they are not torn, punctured or made ineffective in any way. A visual inspection helps detection of cuts or tears, but a more thorough inspection by filling the gloves with water and tightly rolling the cuff towards the fingers helps revealing any pinhole leaks. Gloves which are discoloured or stiff can also indicate deficiencies caused by excessive use, age or degradation from chemical exposure. Any gloves with impaired protective ability are to be discarded and replaced. Reuse of chemical-resistant gloves is to be evaluated carefully, taking into consideration their absorptive qualities. A decision to reuse chemically exposed gloves is to take into consideration the toxicity of the chemicals involved and factors such as duration of exposure, storage and temperature. Employees who face possible body injury of any kind which cannot be eliminated through engineering, work practice or administrative controls, are to wear appropriate body protection while performing their jobs. In addition to cuts and radiation, there are other workplace hazards which can cause body injury. These hazards are (i) temperature extremes, (ii) hot splashes from liquid metals and hot liquids, (iii) potential impacts from tools, machinery and materials, and (iv) hazardous chemicals. There are many varieties of protective clothing available for specific hazards. Employees are required to wear personal protective equipment only for the parts of the body exposed to possible injury. Examples of body protection include laboratory coats, coveralls, vests, jackets, aprons, surgical gowns and full body suits. Full body suits can further be categorized into fully encapsulating suits, non-encapsulating suits, firefighter’s protective clothing, proximity or approach clothing, blast or fragmentation suits, and radiation protective suits. All of these necessitate the use of protective boots, gloves and hoods as well. Totally encapsulating chemical protective suits are to be capable of maintaining positive air pressure and prevent inward test gas leakage of more than 0.5 percent. Protective clothing comes in a variety of materials, each effective against particular hazards. Paper like fiber is used for disposable suits and it provides protection against dust and splashes. Treated wool and cotton adapts well to changing temperatures. It is comfortable and fire-resistant, and protects against dust, abrasions and rough and irritating surfaces. Duck is a closely woven cotton fabric which protects against cuts and bruises when handling heavy, sharp or rough materials. Leather is often used to protect against dry heat and flames. Rubber, rubberized fabrics, neoprene and plastics protect against certain chemicals and physical hazards. As with chemical protective gloves, the selection of appropriate chemical protective clothing involves a variety of factors. Examples of factors which influence the selection include the type of chemicals handled, the physical environment (site hazards), duration of contact, nature of contact (total immersion, splash, vapour or gas), PPE use and the accommodation of other selected ensemble equipment, decontamination and disposal, and limitations during temperature extremes, heat stress and other medical considerations. Determining the need to provide hearing protection for employees can be challenging. Employee exposure to excessive noise depends upon a number of factors which include (i) the loudness of the noise as measured in decibels (dB), (ii) the duration of each employee’s exposure to the noise, (iii) whether employees move between work areas with different noise levels, and (iv) whether noise is generated from one or multiple sources. Generally, the louder the noise, the shorter the exposure time before hearing protection is required. For example, employees can be exposed to a noise level of 90 dB for 8 hours per day before hearing protection is required. On the other hand, if the noise level reaches 115 dB, hearing protection is required if the anticipated exposure exceeds 15 minutes. Noises are considered continuous if the interval between occurrences of the maximum noise level is one second or less. Noises not meeting this definition are considered impact or impulse noises (loud momentary explosions of sound) and exposures to this type of noise are not to exceed 140 dB. Examples of situations or tools that may result in impact or impulse noises are powder-actuated nail guns, a punch press or drop hammers. If engineering and work practice controls do not lower employee exposure to workplace noise to acceptable levels then it is necessary for the employees to wear appropriate hearing protection. It is important to know that hearing protectors reduce only the amount of noise which gets through to the ears. The amount of this reduction is known as attenuation. This differs according to the type of hearing protection used and how well it fits. Hearing protectors worn by employees are to reduce the employee’s noise exposure to within the acceptable limits. Important hearing protection devices are described here. Earplugs are inserted into the ear canal to provide a seal against the canal walls. Formable foam or ‘rolldown’ earplugs are rolled between the fingers to compress them for proper fit. They can be made from polyvinyl chloride or polyurethane. Preformed earplugs are made of flexible vinyl materials and come in different sizes. Custom moulded earplugs are made from impressions of the individual employee’s car canal. Semiaurals or banded earplugs are small stoppers that seal against the entrance to the ear canal by force of a band worn under the chin or behind the neck. They typically provide less protection than earplugs or earmuffs. They are most suitable for short-term use, as they are less comfortable than other devices. Earmuffs enclose the entire external ears inside rigid cups. The inside of the cup is filled with acoustic foam, and the perimeter of the cup is fitted with a cushion that seals against the head around the ear by force of the headband. Glasses, facial hair, long hair or facial movements such as chewing can reduce the protective value of earmuffs. Safety helmet with either built in or attached hearing protection is not typically used in industrial settings. Respiratory protective equipment is used to prevent dangerous chemicals from entering the respiratory system of the wearer. It is also used to provide breathing air when working in a dangerous environment where there is risk of oxygen deficiency or presence of dangerous chemicals in the air at high concentrations. There are three basic classes of respirators which are normally used. They are (i) air purifying respirators, (ii) air supplied respirators, and (iii) self-contained respirators. Air-purifying respirators are used to remove contaminants from the inhaled air. They are not suitable for use in an environment which is deficient in oxygen. The types of air purifying respirators are given below. Particulate filter respirators – These consist of a face piece and a filter unit. Filters of various pore sizes are available for different type and size of particulate matter. They do not offer any protection against gases or vapours and are generally used for non-emergency exposures. Chemical cartridge respirators – These consist of a face piece normally fitted with an exhalation valve and connected directly to one or two chemical cartridges filled with a limited quantity of granular sorbent. They are useful for protecting against specific vapours and gases of low toxicity. Different types of contaminants require different types of chemical cartridge. Gas masks – These consist of a full-mask face piece, which covers the eyes, nose and mouth, connected either directly or via a non-kink flexible hose to a canister containing a granular sorbent. The filter, cartridge or canister has limited capacity for the specific contaminant. This limits the duration of protection offered by the respirator and its use in environment with high contaminant concentrations. Chemical cartridge or canister has a limited life and it needs to be replaced if the expiry date is reached. In the case of air supplied respirators, the user is supplied with breathing air through a hose from an un-contaminated source. Air supplied respirators can be used regardless of the type or physical state of the contaminant, provided that they are properly selected and adequately supplied with fresh air. 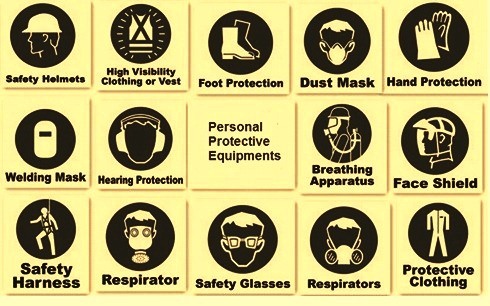 The types of air supplied respirators are given below. Hose masks (with or without blower) – These consist of a full-mask face piece, with inhalation and exhalation valves, connected by a flexible hose to a breathing air supply. The air is blown in either by the user’s respiratory effort (without blower) or supplied under pressure by a hand operated or power-operated blower (with blower). The hose mask with blower is considered safe for work in atmospheres where there may be dangerous concentrations of dust, fumes, vapour or gas. Airline respirators – These respirators consist of a full mask or half mask face piece supplied with air through a hose from a compressed air source. Airline respirators are used in atmospheres which are not immediately dangerous to life, and offer the most acceptable form of personal protection in operations requiring continuous use of respirator. Abrasive blasting respirators – These respirators are designed specifically to protect the employees engaged in shot, sand or other abrasive blasting work where the air is contaminated with high-velocity particles. The respirator is essentially an airline respirator with additional mechanical protection in the form of a full mask (with hood and cape) or a rigid helmet. Air supplied hoods – These are similar to the hood-type abrasive-blasting respirators but are of lighter construction and have a larger viewing panel. They are generally of the disposable type and are particularly suitable for spray painting and grinding work. It is essential that air supplied from the compressor is not contaminated with carbon monoxide or other gaseous contaminants which can come for example from the exhaust system of the compressor. Self-contained respirators (breathing apparatus) popularly known as SCBA are essentially consist of a high pressure cylinder of air or oxygen connected to a face piece via a tube with demand valve and regulator and a harness assembly for mounting the apparatus on the body. Breathing apparatus has the following features. It provides complete respiratory protection in any concentration of dangerous gases, and is the equipment of choice for use in emergency life-threatening situations. The movement of a person wearing SCBA is not restricted by the hose attachment as for the case of supplied-air respirators. However, the duration of use of SCBA is limited by the capacity of the gas cylinders. SCBA is heavy and bulky. A high level of operator training is needed for ensuring its safe use. Suitable respirator is needed to be selected according to the hazards associated with the chemical operation and the working environment. Problems associated with the use of respirators are as follows. Respirators can affect the health of the employee using the equipment because of added stress on the pulmonary system. Medical evaluation may be needed to determine whether the employee can wear the respirator without difficulty. It is essential that a good seal between the face piece and the wearer’s face is maintained in order for a suitably selected respirator to provide the intended level of protection to the wearer. A face-fit test of the respirator may be needed. Compatibility with eyeglasses and safety goggles need to be assessed. Wearing eyeglasses or safety goggles with a respirator can interfere with the face piece fit of the respirator. For working at heights, it is necessary to adopt basic safety precautions including the provision of suitable working platforms, safe access and egress and the erection of suitable guardrails at hazardous locations. If these safety precautions are not feasible, safety belts are to be used. Common types of safety belts are (i) with full body harness to be used to prevent falls, and (ii) general purpose safety belt and its lanyard are to be used to restrict movement while working. In addition to a safety belt, the entire fall protection system for working at heights is also to consider the area surrounding the worksite so as to, for example, prevent striking against nearby structures in the event of a fall. Environmental factors are also to be taken into account so as to avoid high temperatures or smoke affecting the performance of each of the components of the system. High visibility clothing is a type of personal protective equipment. It is any clothing worn which has highly reflective properties or a colour which is easily discernible from any background. Yellow waistcoats worn by emergency services are a common example. Occupational wearers of clothing with high-visibility features include employees working on roads, for plant railway system, or other places where they are near moving vehicles or in dark areas. EN ISO 20471:2013 specifies requirements for high visibility clothing which is capable of visually signaling the user’s presence. The high visibility clothing is intended to provide conspicuity of the wearer in any light condition when viewed by operators of vehicles or other mechanized equipment during daylight conditions and under illumination of headlights in the dark. Performance requirements are included for colour and retro-reflection as well as for the minimum areas and for the placement of the materials in protective clothing. Coveralls, jackets, pants and aprons are available for operations involving high heat or liquid metal splashes. Leather is the traditional protective material for many welding operations. Where there is exposure to radiant heat as well as liquid metal splashes, aluminized garments can be used. They reflect up to 95 % of the radiant heat. Flame-resistant cotton coveralls, designed for comfort as well as protection, are sometimes preferred. Whatever the type of clothing used for welding operations, it is not to have external pockets or cuffs. Fabrics of silica, ceramic and fiberglass eliminate the need for asbestos and are now available for welding operations. These fabrics are available in many combinations of colour and weight. The fabrics are functional over a temperature range of 400 deg C to 1100 deg C.